This post marks the end of my series on how to develop a comprehensive marathon nutrition plan. The first article discussed the importance of teaching your body to burn fuel more efficiently in marathon training. The second article provided ideas on how to practice you marathon nutrition strategy in training. Finally, the third article demonstrated a specific nutrition plan for the days before the marathon. To finish the series, this article will overview how and when to drink during the marathon race. Developing and executing a strategy for ingesting fluids and energy during the marathon is a crucial step towards success on race day. You can’t expect to just wing it and drink and eat when feel like it if you want to run your best. Developing a race fueling strategy takes practice and intelligent planning. Start drinking fluids early. Don’t wait until you are thirsty or you’re getting hot or dehydrated. If you wait until you’re thirsty, dehydration or glycogen depletion may already be starting. Furthermore, as I discussed in my article on preparing your body for the marathon, the more distressed your body becomes, the more difficult it is for your digestive system to process all the fluids and energy you take in. By taking in fluids early in the race – when you’re not yet fatigued or stressed – you give your digestive system optimal conditions to get the electrolytes and sugars distributed to the muscles that need them. Begin by taking fluids at the first aid station available. Usually the first station comes right around the 5k mark. I suggest ingesting an electrolyte drink with sugar so you can keep your fuel levels topped off. Unless you’re taking a GU, I think water is better on you than in you during hot days, so opt for the Gatorade at the first few aid stations. You should aim to take in 6-10 oz of fluid every 2 to 3 miles. If it is a hot day you’ll need to take in a bit more. So, take a look at the race website of the marathon your running and plot out where each aid station is. This way, you’ll know ahead of time which stations will provide you with the Gatorade, water, or GU’s you will need. Remember, you don’t have to gulp everything down in 5 seconds; you can take your time and carry the cup with you. If you hear or feel sloshing in your stomach, you don’t have to drink for the next 30 minutes since this usually signals that your stomach is full. What about Energy Gels or other solid Energy Sources? I suggest waiting until the first 45 minutes to an hour to begin ingesting solid/gel fuels. This will usually occur between 5k and 10k depending on how fast you are running. Waiting 45 minutes to an hour gives your body time to get in a rhythm, get comfortable, and efficiently process the simple sugars you’re ingesting. When ingesting a gel/gummy/bar make sure you always take it with water, not Gatorade. Both Gatorade and GU’s contain high amounts of simple sugars. Combining the two at the same time means you’re ingesting too much simple sugar at once. Your digestive system can’t process all that sugar efficiently, which may lead to cramps and side stitches. Following this same logic, you should aim to consume a Gel every 45 minutes to an hour. If you consume them too frequently, your digestive system might react negatively towards the high amount of sugar. Walk through the aid stations if you plan on running over 3:45 for the marathon or over 2 hours for the half marathon. If you’re planning on being faster or very close to these times you can run through the water stations, but make sure you take the time to get as close to 8oz as possible. If you do plan on running through them you need to practice drinking while running during you training. 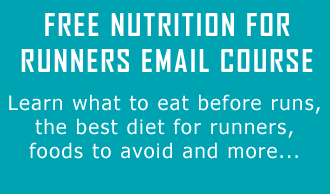 If you follow these tips and the information from my other articles you’ll go a long way towards ensuring success on race day. No matter what strategy you decide to implement, make sure that you practice your nutrition plan as often and as specifically as possible during your training. Be creative and have fun, training and racing a marathon is a great experience. Hi Ray, which aspect would you like to join? We would be happy to assist you!